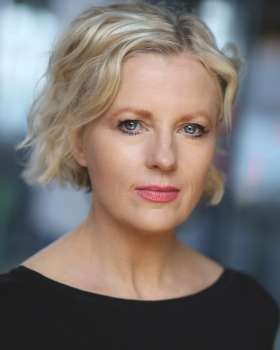 Wendy most recently performed in TRACING GRACE for Theatre 503 and the West Yorkshire Playhouse and has just completed shooting on feature MRS LOWRYS SONS. Before that she played the role of Cheryl in the world premiere of Nessah Muthy's Heroine and Connie in the UK MADE IN DAGENHAM Tour and has been nominated for Offie & BroadwayWorld Awards for Best Supporting Actress. Wendy's many TV and film credits include DOCTORS, CASUALTY, WIRE IN THE BLOOD Season Six, MIDSOMER MURDERS, FINGERSMITH, THE COMMANDER, THE BILL, AMNESIA, MIT, THE FINAL PASSAGE, CLASS ACT, SHINE ON HARVEY MOON, BATTERSEA BARDOT, GHOST HOUR, FULL STRETCH, RUTH RENDELL: A MEANS OF EVIL, TVS OUT OF BLUE, HIGH TIDE,NEW GIRL IN TOWN, SOLDIERS TALKING CLEANLY, SKYLARK, ANDRINA, SHEPPIE, PICTURES and JEWEL IN THE CROWN, Film, Nancy, Edie, Cape Wrath Films, Mark Stothert Feature Film, Lorraine, ENGLISH GOODBYE, Andy Heathcote Feature Film, Cynthia, BIRTH OF THE BEATLES, Richard Feature Film, Cherry, THE MIRROR CRACK'D, Guy Hamilton Feature Film, Megan, 84 CHARING CROSS ROAD, David Jones Feature Film, Mollie, YANKS*(Evening Standard Award for Most Promising Newcomer), John Schlesinger.